I offer remote attunements for any of the Alternative Reiki practices that I teach. All of the remote attunements include an electronic manual and a certificate of completion. If you do not see an attunement you that interests you, use the Contact Us form to inquire. It may be something that we are able to do via remote. Faery Reiki is an earth-based focus of chi energy using symbols that represent the elements and spirit. It will help you connect with the faery realm and channel their energy into your work. The founder of the system, Violet Paille, channeled this instruction during her Celtic Reiki attunement in 2005. The system is gentle, passive and works with the energies of nature and fae elementals. It is particularly effective when working with animals who may be too nervous for traditional Reiki therapy. Completion of the attunement allows the participant to attune others and to practice at the level of Master. You will receive a remote attunement with 6 symbols, a reference manual, and a Certificate of Completion. All of us have Spiritual Energy Wings. 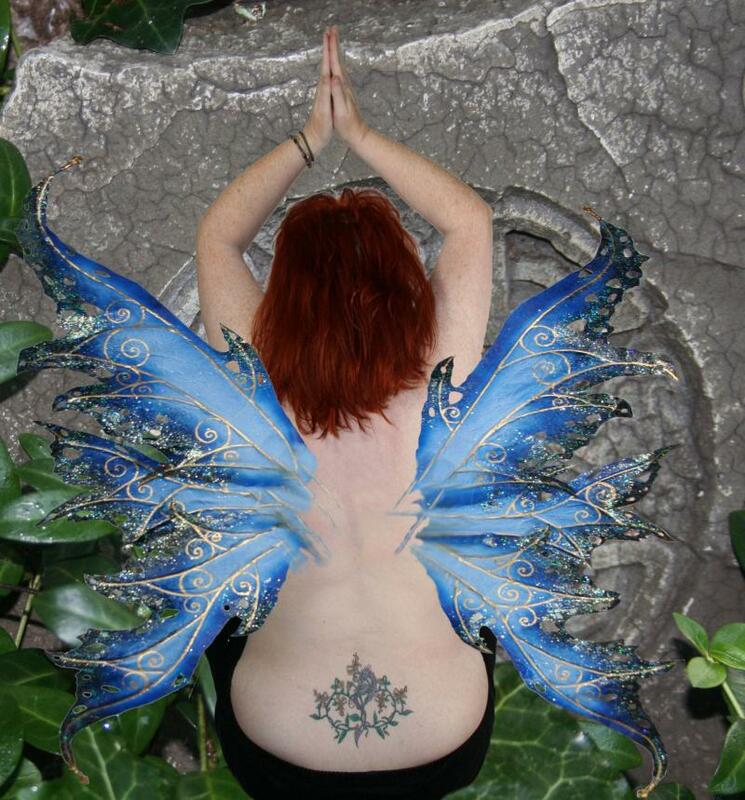 Your energy wings may resemble those of a faery, angel, or bird. We can awaken our wings and use them to channel energies or provide comfort and care. You will learn to unfurl your wings and attune them to the Divine Energies. In this Reiki system you will be attuned to the energy of Excalibur and you will tap into the archtypal energies of Merlin and the Lady of the Lake. This system is excellent for manifestation and clearing away external obstacles to success. You will learn to use the principles of alchemy to create the reality you want to live. You will receive a remote attunement with 2 symbols, a reference manual, and a Certificate of Completion. This course is for existing Reiki practitioners. Reconnecting with our Elemental Forces again with help from Dragons. Dagons are the mightiest forces of the ethereal realms. They are intelligent, wise, and are connected with magic; the keeper of secret knowledge. They are able to show up simultaneously in the elements of water, air, fire and earth. You will receive a remote attunement with 7 symbols, a reference manual, and a Certificate of Completion. Dragon Reiki 2 is the master level and is an extension to Dragon Reiki Level 1. The five new symbols are used in a separate connection to special Dragons and their abilities. These symbols make it possible to use the abilities of the Dragons more purposefully and effectively; to adjust or transform our own abilities with the corresponding other Dragon power. You will receive a remote atunement with 6 symbols, a reference manual, and a Certificate of Completion. Dragon Ki allows you to access the Ki or Chi of Dragons and is an extension of existing healing Reiki practices. You will receive a remote attunement with 1 new symbol, a reference manual, and a Certificate of Completion. Magic Reiki is an energy system dealing with protection from negative forces and energies. Apart from healing the body, soul and life; the energy connections with the upper and lower worlds allowing information to be received. You will receive a remote attunement with 1 symbol, a reference manual, and a Certificate of Completion. The essence or spirit of each tree is different; both by species and by individual tree. This attunement allows you to work with the guardian of each of the basic 16 "Faery" tree species; to feel the energy and hear the voices of trees. This attunement works with energy elixirs or the essence rather than with symbols. No previous Reiki experience is required. You will receive a remote attunement, a reference manual, and a Certificatee of Completion. The Life Path Empowerment will help you discover your life's path and to stay on that path. It gives you access to communicate with and receive guidance from your spirit guides. The symbol helps you focus your connection. This attunement works with your personal guides. No previous Reiki attunement is required. Whether you desire a Partner, a Twin Flame or a Romantic Love, setting the intent is the first step. This attunement allows you to remove blocks to connecting and attracting; no previous Reiki is required. I have always seen things that others did not; as I grew up I learned to keep them to myself but I never really lost the ability or the longing. I continued to study and learn on my own but during the 2012 energy shift I found the calling to put the skills I have learned into practice. Thru Reiki practice I found my interest in energy raising, space clearing and cleansing, and remote healing. I am particularly interested in the alternative Reiki traditions with their various symbols and attunements. I work directly with the energy of the earth, elementals, and nature to center and heal. I enjoy teaching others to tap into the energy as well. My hope is for everyone to see the fairies at the end of the garden and the dragons in the lake and to believe in magic again. Copyright 2013 Energy of Magick. All rights reserved.